The former member of a chart-topping 80s boy band has started work as a holistic therapist in Worthing after years spent living as a Buddhist monk in Thailand. From the age of 17, Nick Thorp was the bassist in Curiosity Killed the Cat, a band whose debut album Keep your Distance hit the number one spot in 1987. But Nick struggled with drug and alcohol addiction and, after learning he was going to be a father aged 25, he left the band to get sober. He said: “Alcohol and drugs were stealing all the things that were important to me as a human being, as a productive person. “It was my band, I started it with the drummer and it was my baby – but I had some choices to make. Among the treatments Nick will be offering at Laroma Therapies in Buckingham Road is addiction counselling. Now 28 years sober, Nick said his experiences helped him connect with others in a similar situation. “I can look people right in the eyes and say, I get it, I really get it,” he said. Nick said the first ten years after leaving the band were ‘a rocky road’. His work running a music business became ‘like an addiction itself’ but finally in 2000 Nick changed his life completely and began studying Buddhist psychology. He lived in Sri Lanka for six years before moving to Thailand to become a Buddhist monk. Over the years he has gained expertise in fields from reiki and yoga to intuitive energy healing and dialectic behavioural therapy, all of which he brings to his teachings. He said he has had some ‘weird’ experiences during his time abroad and is currently writing a book about the 54 days he spent living in the jungle following the life of the Buddha, eating one meal a day, chanting and walking 700 miles in total. Three months ago, Nick decided to move back to the UK to be closer to his family – a transition which he said had been ‘quite difficult’. 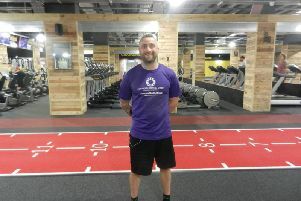 He decided to run his therapy sessions from the wellbeing centre in Worthing after a chance meeting with the owner of Laroma Therapies, Lauren Tapp. Nick will design personalised programmes to help people suffering with issues such as depression, overeating and addiction, or who are going through a crisis or feel unfulfilled, to reach their full potential. He said a lot of what he teaches is about acceptance and being present. Music has always remained a big part of Nick’s life and he is currently working on a solo album with a group of musicians in Brighton, where he now lives. Asked whether he misses his life in the band, which performed all over the world and worked with famous names including Andy Warhol, Nick said: “I love what I do now. “That was great when I was in my 20s, this is great when I’m in my 50s. Lauren said she was ‘really excited’ about Nick joining Laroma Therapies, which has won two awards in the two years it has been going. She said it was very important for the wellbeing centre to raise awareness of mental health issues. Find out more about Laroma Therapies here.